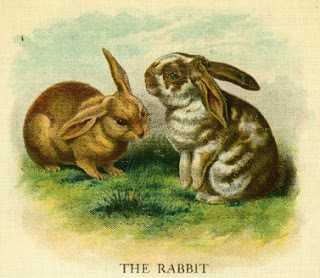 I forgot I had this vintage bunny picture on my computer, I downloaded it ages ago. I thought it would be perfect for a vintage inspired Easter card. I also made this for the 'Lets Get Scrappy' Week #3 challenge at The Shabby Tea Room. I raided my bits and pieces box for the background papers, lace and ribbon. I focused on peach and gold tones to give this card a nice warm feel. I added some stitching detail using the sewing machine in warm gold thread. The stamped green frame is from Anna Griffin In the Garden set. I painted the outer frame in Autumn Wheat Creative Inspirations paint. The bow detail is a piece of lace gathered in the centre, a satin bow on top and a little bow made from a piece of garden twine. I sewed these together by hand to make them a bit more secure before adding them to the card. The sentiment is from Studio G and I used blending chalks to soften the edges. I used foam pads to add the sentiment and layered bunny image to the card. I really like how it turned out, I have a real soft spot for bunnies (who doesn't) and it was a really nice image to work with. Other: Scraps of lace, braid trim, peach satin ribbon, blending chalks, foam pads, glue, scissors, needle and thread, soft gold thread, sewing machine, garden twine. Ok, this is gorgeous! SO gorgeous! Love that vintage image, and all your detailing is fabulous. Thanks for playing along with us at The Shabby Tea Room. Thanks for the lovely comments, so glad I found The Shabby Tea Room, I just love it!